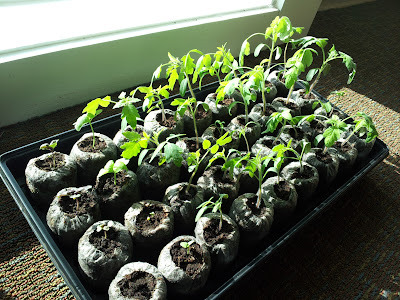 So, I started a LOT of seeds this year, with some success and some failures. I might as well start with the failures. Attempting to start foxgloves and creeping thyme from seed was extraordinarily unsatisfying. 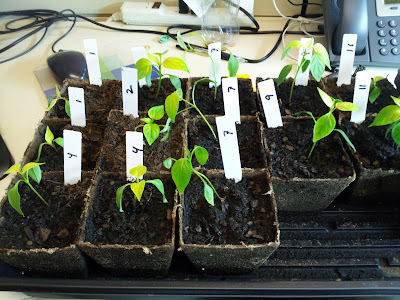 They grew very very slowly, and I think I had some trouble with moisure levels and the seedlings suffered for it. I ended up composting all of them. I bought some thyme starts at the farmers market. I had very similar problems with most of the small, slow growing herbs that I started, and like the others, these also all ended up getting composted. I simply don't have the patience for things that don't pop up fairly sturdy from the beginning. I'll stick to buying herbs at the farmers market when I need them. Onto the success stories. As always, I found the tomatoes and peppers and basil fairly easy to start and not too troublesome. I started the peppers in jiffy peat pellets and recently transplanted them to 4" pots. Germination rates varied from 40% to 100%. Two varieties were the poorest germinators - the Asian Sweet Peppers that I got from one of Adrienne's co-workers (specific variety unknown!) and the NuMex Vaquero - a jalapeno variety from the New Mexico Chili Pepper Institute. I did have a little problem with some of the peppers where they are yellowing a bit. I think this might be due to a lack of some nutrient either from over watering or not transplanting into actual soil soon enough. I might use regular seed starting mix next year instead of peat pellets. The tomatoes are growing fabulously. I purchased one of the large Jiffy "tomato starting kits" which has larger peat pellets suitable for the fast growing tomatoes. I also started the basil in these, even though they are slower growing. 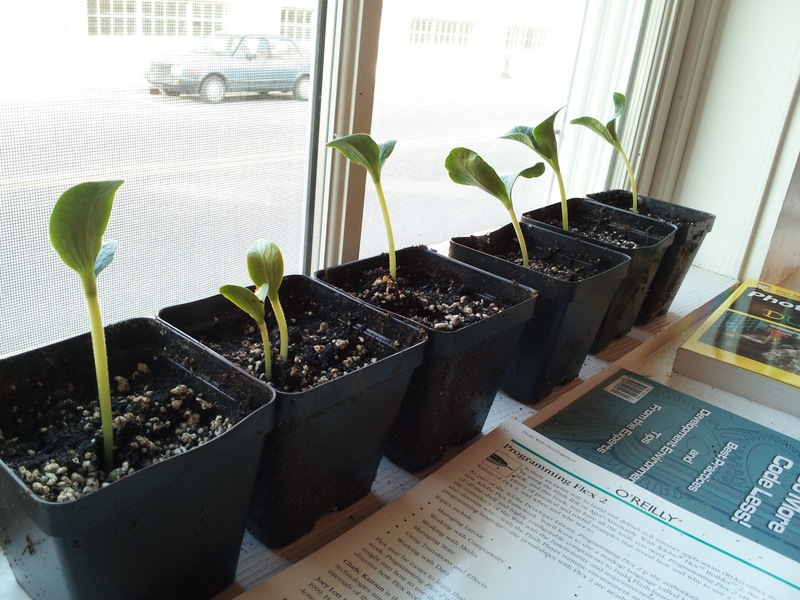 The only variety that didn't germinate as well was the Amish Paste. I ended up planting a couple more seeds in the pellets that didn't germinate and they finally came up. 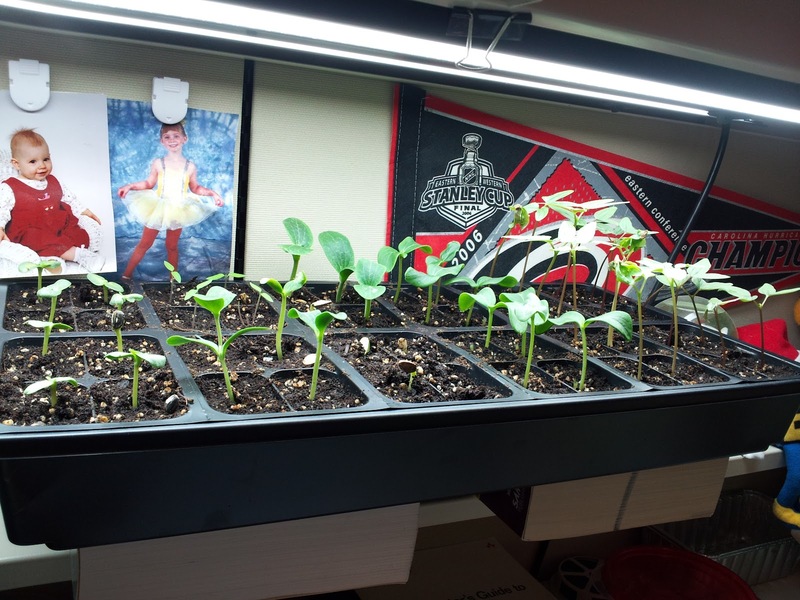 For the final seeds that I started a few weeks ago, I decided to use the more standard cell packs with seed starting mix instead of the peat pellets. This has worked out incredibly well, though the seeds I started are typically fast growers - zucchini, cucumber, sunflowers, morning glories, cardinal climbers, ornamental gourds, and pumpkins. The pumpkins are actually in 4" pots rather than the cell packs because they do start out pretty fast and pretty big. They would outgrow the 72 cell packs far too fast! the cell pack method worked really well and might actually be a better choice for me in the future than the peat pellets. I will probably do all my seeds next year in the cell packs. All that being said, here are some pictures! 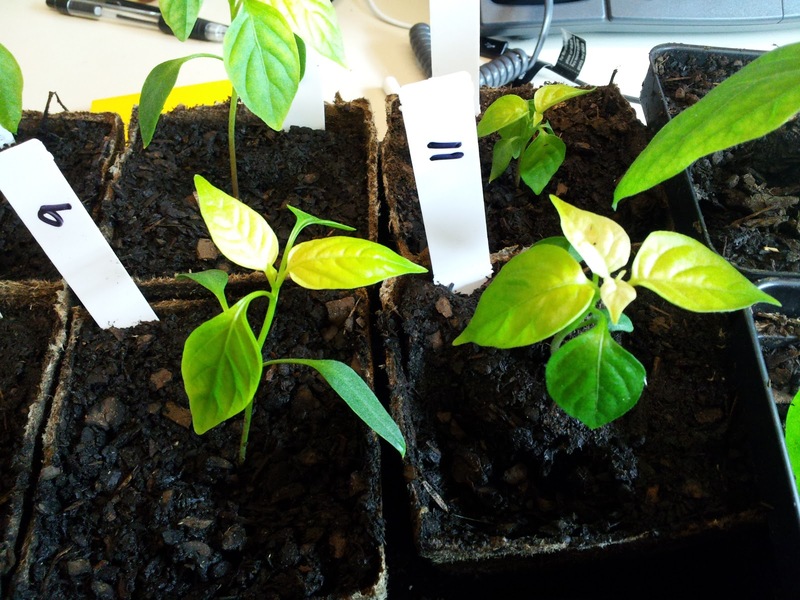 Yellowing of leaves on pepper seedlings.